Cut your networking cable, strip off the jacket and then attach a 6P6C or 8P8C connector to the end... all with one tool! Its ratcheting mechanism keeps the pressure on until the crimp cycle is complete: just keep squeezing until it releases. 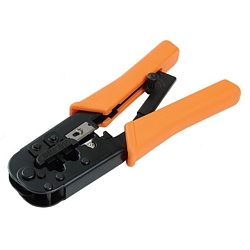 It strips both flat and round cable and can be used to crimp 8P8C ("RJ-45"), 6P6C ("RJ-12") and 6P4C ("RJ-11") connectors. Modular plugs not included.